Chloé Eau de Parfum, a fresh and feminine fragrance that captures the creative, confident individuality of the Chloé woman. The scent takes the classic rose and ingeniously translates it into a vibrant perfume, intimate and sensual. 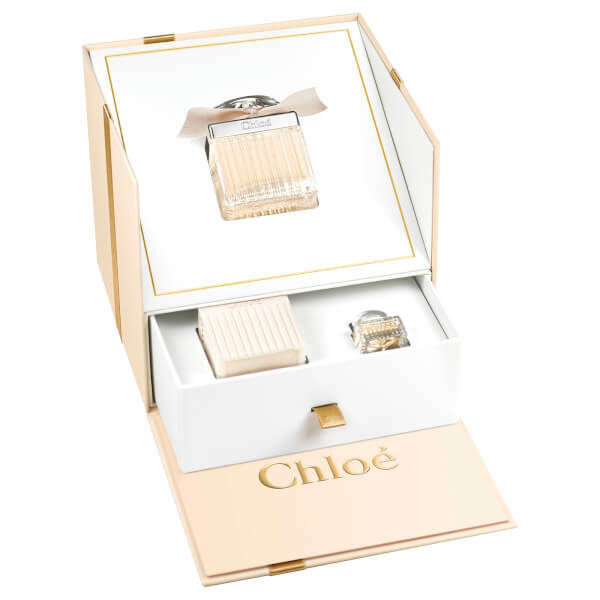 Chloé Eau de Parfum begins with a combination of floral powdery notes, hints of peony and lychee and springtime freesia. The airy, flirtatious head notes drift away to reveal the richer and more sensual side of the rose. The distinctive character of this unique rose is accompanied by magnolia and lily of the valley, as well as subtle intimations of warm amber and elegant cedarwood. The fragrance is enclosed in a modern, delicately pleated bottle adorned with a hand-tied ribbon. Chloé Perfumed Body Lotion leaves the skin delicately perfumed with Chloé’s signature fragrance: the central note comes from the rose heart for a fresh and feminine scent suited to a free spirit with an utterly innate sense of chic. Parfum: Alcohol Denat., Parfum/Fragrance, Aqua/Water/Eau, Butylphenyl Methylpropional, Ethylhexyl Methoxycinnamate, Acrylates/Octylacrylamide Copolymer, Alpha-Isomethyl Ionone, Benzophenone-3, Benzyl Salicylate, BHT, Butyl Methoxydibenzoylmethane, Citronellol, Ethylhexyl Salicylate, Geraniol, Hexyl Cinnamal, Hydrolyzed Jojoba Esters, Hydroxycitronellal, Hydroxyisohexyl 3-Cyclohexene Carboxaldehyde, Limonene, Linalool, Fd&C Red N°4 (Ci 14700), Fd&C Yellow N°5 (Ci 19140). Lotion: Methoxycinnamate, Acrylates/C10-30 Alkyl Acrylate Crosspolymer, Benzophenone-3, BHT, Butyl Methoxydibenzoylmethane, Butylphenyl Methylpropional, Cetyl Alcohol, Citral, Citronellol, Disodium Edta, Ethylhexyl Salicylate, Geraniol, Hydroxyisohexyl 3-Cyclohexene Carboxaldehyde, Sodium Cetearyl Sulfate, Tocopheryl Acetate, Triethanolamine, Xanthan Gum, Chlorphenesin, Phenoxyethanol, Fd&C Red N°4 (Ci 14700), Fd&C Yellow N°5 (Ci 19140).